A SWOT analysis is an incredibly simple, yet powerful tool to help you develop your business strategy, whether you’re building a startup or guiding an existing company. What is the dictionary definition of SWOT Analysis? 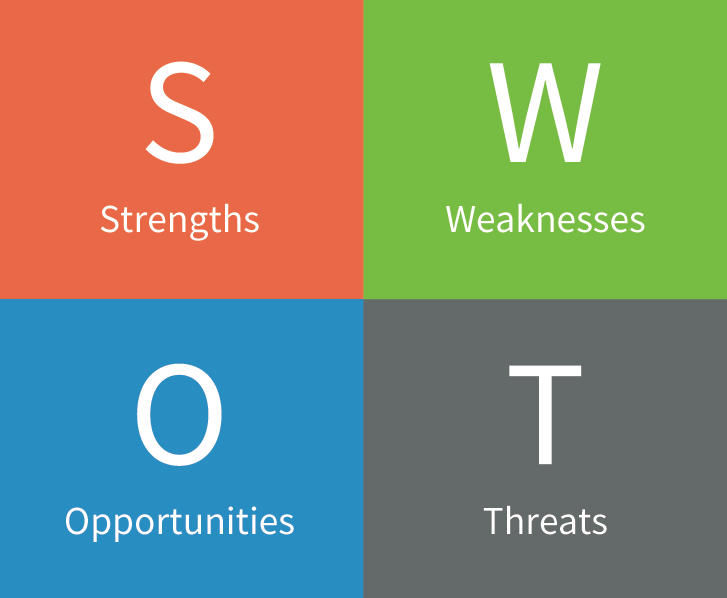 SWOT provides an analysis matrix for identifying the strengths, weaknesses, opportunities and threats to an organisation, and acts as a form of appraisal as to it’s current position at a particular time and as to it’s future potential. Strengths and weaknesses are internal to your company—things that you have some control over and can change. Opportunities and threats are external—things that are going on outside your company, in the larger market. You can take advantage of opportunities and protect against threats, but you can’t change them. Examples include competitors, prices of raw materials, and customer shopping trends. What are weaknesses in SWOT? How do you write a good SWOT analysis? What are the opportunities and threats? How do you do a SWOT analysis for a team? What are the advantages of SWOT analysis?